Although few are kept in captivity in the UK, the chipmunk is probably too well known to most people to need much description. In terms of zoological classification it is a genus (Tamias or sometimes Eutamias) made up of about 24 species that belongs to the Family Sciuridae (ie all squirrels and related mammals), which in turn belongs to the Order Rodenta (rodents). Despite the fame of "Chip and Dale" and the North American chipmunks, most chipmunks kept in the UK are of the Siberian or "Korean" variety. At the moment we keep one chipmunk, Chutney. He was in fact the very first non-piscine pet we bought (ie he wasn't a fish). In what was to become a familiar pattern, I had a phone call at work from my wife asking me if she could have something. Frankly I couldn't believe my ears when she first mentioned the word "chipmunk": I wasn't even aware that people kept them as pets. But I agreed, and eighty or so pounds later I found myself that same day crouched in the back of our estate car clinging to a cage (flat on its back) which held a wooden nesting box, out of which kept peering a small brown inquisitive head. Chipmunks are in some ways ideal pet rodents, provided they are housed properly. Being arboreal, they need a tall cage rather than the house-type structure favoured for rats and gerbils, and they should certainly not be kept in aquaria, even if you could find one large enough. Chutney has been living in a wire cage about 4ft x 3ft x 3ft, which gives him plenty of room to leap about in and will also hold a couple of branches and a nestbox. The wire mesh should be large enough for him to have easy handholds on: ours will allow him to stick his snout out (but not his head) without scraping it. As one might expect from a tree-dweller, he lives in a wooden nestbox at the top of the cage, which has an opening on the front just wide enough for him to enter and leave. The cage also has a removable wooden tray filled with wood shavings at the bottom, which collects not only his faeces but also stray peanut shells, husks and the other detritus that Chutney quickly accumulates. We have found it useful to have the whole cage standing on a low coffee table, both in order to see him better and to stop any overspill of detritus from hitting the carpet. It also makes moving it easier when it comes to cleaning. As chipmunks are inquisitive and playful creatures, a variety of cage furniture is a must. We gave him a couple of branches (both horizontal, across the middle of the cage halfway up, and vertical leading down from his box), and a china bowl. Curiously, he always keeps the latter on its side and sits in it, rather like Number Two in The Prisoner. In fact, he will often sit there for hours. A food bowl is an obvious necessity, as is a water receptacle: we use both a bowl and a drinking bottle fixed to the side of the cage. Chipmunks are easy creatures to feed as they will take a wide variety of foods. However, as with many rodents, nuts and other seeds form the bulk of their diet, and commercially available chipmunk food does consist mainly of this, plus the odd bit of dried fruit. Peanuts are a favourite, followed by sunflower seeds. Offering him these by hand is a good way to gain his trust. Chutney also likes the occasional egg yolk, although he never consumes a whole one, and relishes a small dish of chopped fruit and veg occasionally. An interesting thing is his reaction to mealworms, which I normally feed to our lizards: if offered one, he will greedily grab it and devour it, then beg for more. Until the spell wears off, he will shun all other food, even his choice favourites. For that reason I wouldn't recommend giving your chipmunk too many of these treats, but an odd one now and again probably offers variety. Dried vegetable sticks tied to the side of the cage are also gnawed literally down to the wood, and we also normally clip a salt wheel on nearby. Like all rodents (and indeed nearly all animals), chipmunks need a standing supply of water. They are quite clean and do not normally defecate into a water bowl, but they do sometimes knock it over or drop bits of food, etc, into it. A water bottle is therefore a good idea. We put pet rodent vitamin drops into the water that we give him. Chipmunks seem to be thirsty at times, as we have often seen Chutney come out of his cage in the middle of the night and descend just to have a long drink, and then return to his box. Being creatures of temperature to cold climates (Siberia and North America) they may find hot weather stifling, so an adequate supply of water during these times is essential, as is a reasonable amount of ventilation. This is why wire mesh cages are to be preferred. 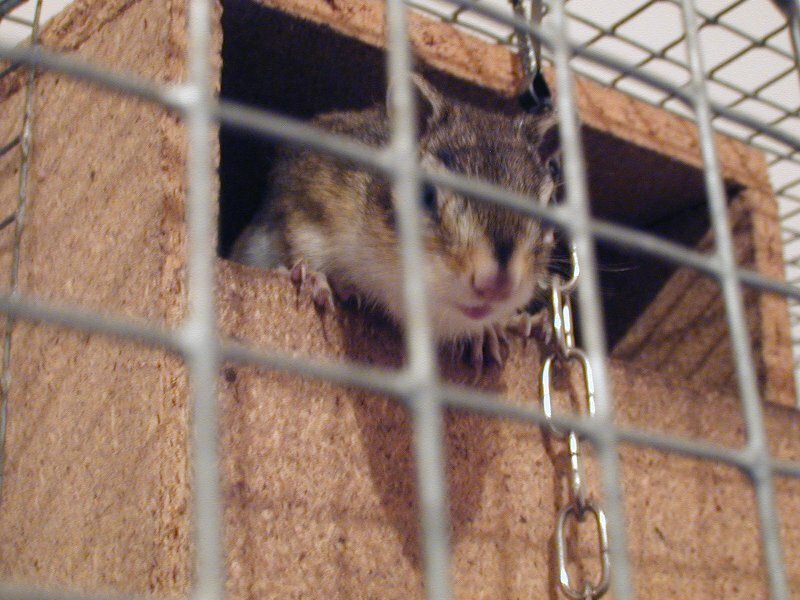 As stated earlier, chipmunks are clean creatures and will usually choose one corner of the cage to defecate in. This will result in a small but steadily growing pile of black stools which should not be left too long, as they may begin to liquidify in hot weather and attract flies. It is important to notice that chipmunks practice coprophagy, ie they often eat their own droppings. This is in fact normal behaviour for many animals and should not be discouraged. In the chipmunk's case, eating droppings takes back vital minerals which are lost in the process of defecation. Rabbits practice the same, as do baby iguanas who need to ingest their parent's digestive flora (ie they eat their mum and dad's faeces). Behaviourally wise, chipmunks have a lot of personality, perhaps as much as rats, although they are less tame and handleable. They can be trained to sit for a short while with their owners, but this does take time and patience, and we have not succeeded with Chutney. Despite the fact that he won't come running to us, however, my wife has observed that he does seem to like the company of humans in the same room, and sits out longer if we are about. I have noticed also from my observation of other chipmunks that (unsurprisingly) the young tend to be hyperactive, but that they gradually calm down towards old age. 3 years may be considered a good age for a male chipmunk, but here again the calmness is relative, since Chutney still runs up and down the side of the cage or hangs upside down from its roof, looking about. However he does sit for longer spells in his bowl-chair now, and doesn't do loop-the-loop like he used to do. When he was young he seemed to want to show off more, often doing frenzied manouvres for the sake of them. It is also wise not to let the chipmunk get over-excited, as this can cause it distress. Let it jump and run around, but leave the cage door open and after a decent interval try to gently persuade it to return, eg with some fresh food in the bottom of its cage. The first time we let ours out, we probably over-encouraged him with the effect that he went a bit manic, did not want to return, and subsequently stayed in his box for a few days and had to be taken to the vet. Fortunately this was temporary, but it could have turned out otherwise. It is far better to sit and enjoy their antics rather than attempt to play with them. If they want to come to you, they will do so, even if only for seconds. Although they are brilliant acrobats and have an almost unerring sense of balance, occasionally they will jump for a piece of furniture, only to miss and land on the carpet: Chutney did this once, just missing the rocking chair, and as he fell towards the carpet his arms were flailing in bewilderment like the coyote going over the cliff in Road Runner. Fortunately he was not too high up and was unscathed. While chipmunks are normally safe within a cage or aviary, there are a couple of things to be aware of, especially if you let them out to play. The two major ones are television and cats (and occasionally dogs). Firstly, television. Although some rats and iguanas are reported to enjoy watching television, this emphatically does not apply to chipmunks. The problem is the 15.6 kHz radiation produced by the time-based oscillator [Gillett & White, see Bibliography] which if too near the chipmunk causes distress, loss of litters and even death. It is suspected that this frequency is the same as sensitive area of the chipmunk's hearing range. Although we keep Chutney in the front room, we positioned his cage diagonally opposite the corner that the TV sits in, so they are as far apart as possible. (Having said that, if the sound is not too loud, he sometimes sits at the entrance to his box apparently watching). Use your sense and discretion: most animals dislike loud noise anyway. Cats are an obvious problem, but just because the chipmunk is an agile leaper and climber you should not assume it is safe. Cats are very efficient hunters, and ours is very attracted to Chutney for all the wrong reasons. While our chipmunk at least does not seem bothered by the presence of a large mammalian predator, it makes sense to keep them apart for reasons of mutual stress and frustration. There are a couple of other things to watch out for. Firstly, be careful when you pick up your chipmunk. One morning Chutney managed to squeeze past my hand and out of the cage, and I had to grab him and cup him in both hands. He turned into a furball of fury and bit me so hard and rapidly that he inflicted four bleeding cuts on my hand in the few seconds it took me to place him back in the cage. You should also beware of manhandling a chipmunk with food in its pouches, as this sort of treatment can damage the lining. The other experience we want to share with you is that of cage wheels. Obviously all chipmunks are different to a certain degree, and some chipmunks may be able to use wheels in the same way as a rat does, getting valuable exercise. However, we tried one for a week with Chutney and in the end removed it because it was dangerous. Basically he could not seem to grasp the idea of the wheel and would either jump on top of it, upon which he would be hurled across the cage, or would attempt to run in it and get his tail caught. So if you do wish to incorporate an exercise wheel in the cage, please watch your chipmunk carefully and assess its suitability. The only book I have come across about chipmunks is Chris Henwood's Keeping and Breeding Chipmunks (TFH, 1989). Fortunately it is an excellent book, and unusually for TFH it is published in a hardback format rather than the normal semi-rigid covers. Even better for British (and possibly European) readers, Henwood is British and writes accordingly. The book covers details of the chipmunk most normally kept in the UK, the Siberian Chipmunk Eutamias sibiricus, including its natural history in the wild. Housing is covered comprehensively, including practical details on the construction of outdoor aviaries for a small colony. Unusually (but most welcome), there is also a chapter on Chipmunk Genetics, in addition to one on breeding. 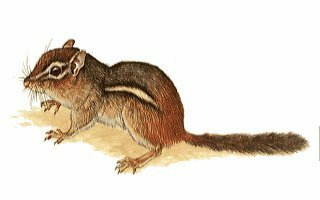 The book concludes with an interesting look at some of the other chipmunk species from North America. Eastern Chipmunks, Secrets of their Solitary Lives, L A Wishner, Smithsonian Institution Press, Washington DC. [NB This last one deals with a North American species]. The amount of links I have found so far to other chipmunk sites has been surprisingly few. If anybody knows of any more apart from the one listed here, I would be grateful if they would let me know. Jon Moore has some excellent and amusing photographs . Sadly, Chutney passed away on 27 October 2000 after two days of short and fairly painless illness, aged about five and a half years. He had been slowing down for some months (since the New Year, in fact) but only really stopped in the last two days of his life, when he suddenly slipped into semi-consciousness with first laboured and then shallow breathing. Feeling his body, we noticed that his backbone was suddenly very prominent, a sign of advanced old age we had noticed in our rats. We made him as comfortable as we could and my wife administered sustenance by hand in the form of water and small pieces of paw paw, until he suddenly stopped breathing on the last night while she was holding him. We laid him gently in his cage to be sure he really had expired, and then placed him in cold storage prior to burial. We intend to bury him in the garden next to the spot where we buried our long-surviving goldfish Churchill, who was really Chutney's contemporary. He will be sorely missed.